Burning Coal Theatre Company, located in Raleigh, North Carolina, is a small, professional nonprofit theater in operation for over twenty years. Director Jerry Davis has successfully operated Burning Coal by combining his passion for theater, business acumen and commitment to community. Fundraising expert and blogger, Gail Perry, chose Burning Coal Theatre Company as a recipient of a grant from the MissionBox Philanthropic Fund. Here, MissionBox co-founder and CEO Kathryn Engelhardt-Cronk talks with theater director Jerry Davis about this love of theater and how he has brought diverse community groups together to celebrate their shared stories. When did you realize you had a passion for theater and performing? I’m originally from Murfreesboro, a small town outside of Nashville, Tennessee. I was fortunate enough to be inspired by a brilliant teacher during high school who introduced me (and my two brothers) to drama and theater. She encouraged us to explore our natural affinity for theater and she had a substantial influence on all of us. I moved to New York after college, spending 12 years there as a working actor. How did you arrive at the decision to open and operate your own theater? I always knew I wanted to operate my own theater, but achieving that goal in New York would be nearly impossible. The reality of real estate in New York meant that I would spend the rest of my life trying to bridge the gap between renter and owner, so I began looking at different cities around the country where I thought I could realistically make this dream happen. I started to look seriously at North Carolina, checking out several different cities, ultimately deciding that the state capital Raleigh was the right choice. The building we're in is a historic structure: the Murphey School. Built in 1908, it's the oldest school building in Raleigh. The reason the building is so important are the events that occurred in the auditorium during the summer of 1960. That July, the Raleigh School Board met in the Murphey School auditorium and voted to begin the desegregation of Raleigh schools. A month later, the first African-American student, 7-year-old Bill Campbell entered second grade, becoming the first such student accepted into a previously ‘white’ school in Raleigh. In fact, Bill Campbell went on to be elected as mayor of Atlanta, Georgia. 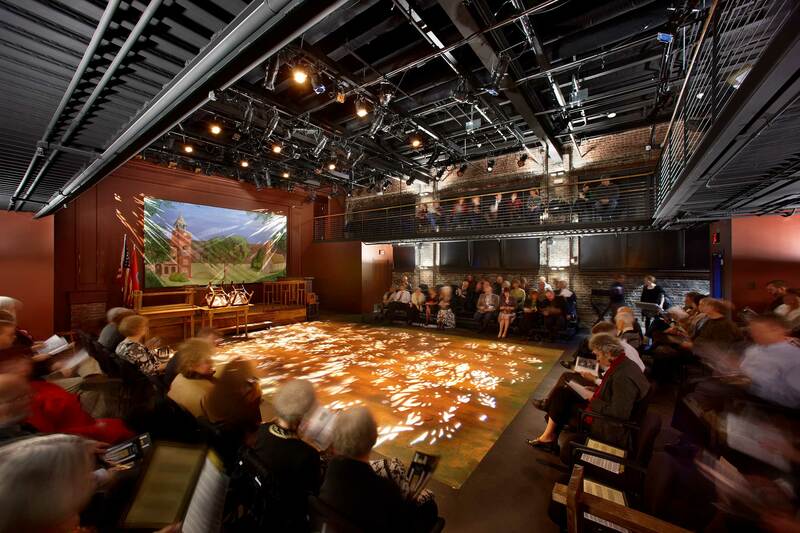 In 2008, Burning Coal Theatre raised $1.5 million in cash (and much more in in-kind contributions) to complete its renovation of the schoolhouse into a state-of-the-art small professional Theater. We've been here for over 20 years now and financial sustainability is critical. We’ve maintained fiscal stability over the years. We've never had a debt and we've always paid every bill. Everyone over the last 20 years has gotten paid and I’m proud of that fact. Many small theaters have closed, but we’ve made it. How did those working years in New York inform your desire to open and operate your own theater? I'm certainly not the first one to say this, but the theater — acting, performing and directing — is not something to enter unless you're entirely committed and passionate about it. If you can do something else career-wise, then do something else. But if you find the theater irresistible, you'll also find it's a lot of fun and you meet a lot of interesting people. Just remember to come prepared to work. You're not sitting in a coffee shop drinking lattes and talking about Gibson. It's moving ladders, sweeping the floor, and taking out the trash and all of those things, until at some point in the future you have enough money to pay somebody else to do that. Mostly it's just hard work, so if you don't love it, don't start. And what matters most is the work. I come from a very rural area and I've always had this idea that the audience is just as important in a place like Raleigh as it is in New York, perhaps more so because the New York audience is more likely to have had a lot of experience in the arts. Perhaps the audience here needs that experience more. How does Burning Coal Theatre Company engage with your community? We do four main stage productions, three on what we call our second stage, which is generally a collaboration with some younger emergent sister companies, and then we do several other events. We even do a play in a cemetery believe it or not! Oakwood Cemetery, a beautiful and historic cemetery — about ten blocks from here — has some very interesting characters that are buried there. And each year we'll write a series of short plays about some of those folks. Burning Coal Theatre makes an effort to draw in and collaborate with other community organizations. For example, the Rotary Club was celebrating its 100th anniversary and wanted us to help tell its story. We have two downtown churches — an African-American and a white First Baptist Church — that 200 years ago started out as the same church. During the turmoil of the Civil War, the churches split apart — although they're just a block apart — and never rejoined as a physical location although they are connected in many other ways. We wrote a play that celebrated their joint history, and we did it as a walking tour so the play would start in one congregation and then move across the street to the other, and we'd flip back and forth as to where we started and where we ended each night. It was a nice way to make connections in the community. I knew when we started that it would be a connection to the old families of Raleigh. But one day we were performing, and a lady came up to me with tears in her eyes. She had just moved to Raleigh from San Francisco, and I said, "Wow, don't tell me this was moving to you, too." And she said, "Yes, because it reminded me that everyone was new here at one time." Our theater is such a good way of connecting different types of people. And people want to be educated, rather than wander around in a daze. When you can give them that and find a way to make it fun, it's a positive thing. I truly feel that Burning Coal Theatre is a lovely example of how a community and performing arts organization can help build and link different parts of the community together. More information on Burning Coal Theatre Company, including the current season, can be found here.